Dry needling (DN), also known as Intramuscular Manual Therapy (IMT) has been found in the literature to improve pain, disability and function. 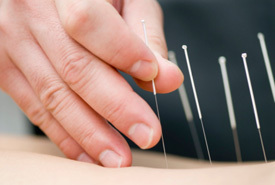 The DN technique is a modern Western medical modality that is not based on Traditional Chinese Medical acupuncture, in that the purpose of DN is not to alter the flow of Qi or energy along traditional Chinese meridians. Dry needling has it’s own theoretical concepts, terminology, and clinical application. Dry needling is based on a modern comprehensive understanding of human neuromusculoskeletal anatomy, pathophysiology and on scientific research and pain models. Dry Needling (DN) is effective for resolving soft tissue dysfunction, such as inflammation, tendonitis, contractures, trigger points, tissue adhesions, microcirculation, edema, and various other neuromusculoskeletal conditions. A comprehensive examination and evaluation of the neuromusculoskeletal systems allows Stephanie Samson, our physical therapist certified in the dry needling technique, to create a musculoskeletal diagnoses based on modern medical concepts that is not based on Traditional Chinese Medicine. This allows her to then develop a comprehensive treatment strategy for each of her patient and decide afterwards if dry needling would be beneficial for each individual patient. Stephanie has completed her certificate of dry needling from the Acupuncture Foundation of Canada Institute (CAFCI) from 2007 to 2010 while practicing in a sport medicine clinic at the Olympic Stadium in Montreal, Canada. She also got her Quebec Board mandatory Recertification in 2012. Please note: Dry Needling is just one modality used in conjunction with the variety of manual therapy techniques and prescriptive exercises, prescribed by a manual physical therapist to restore you to optimal physical function. DN is only one component of a multidimensional treatment approach, geared at creating a successful outcome for you. As a manual physical therapist, we address various neuromusculoskeletal conditions such as biomechanical muscle imbalances, postural dysfunctions, muscular flexibility limitations, strength deficits, swollen or stiff joints, and many other conditions… all of these conditions may require much more than just dry needling.